Alice Marie Pittis, age 95 of Freeport died at 11:40 p.m. Wednesday, August 1, 2018 in Schoenbrunn Health Care Center, New Philadelphia, Ohio. Born November 4, 1922 in Junction City, Kansas, she was a daughter of the late Omer and Hazel Mounts. Marie graduated in 1940 from Wakefield High School, Wakefield, Kansas. She moved to the Freeport area in 1960 with her family. She worked for eight years doing various jobs at National Cash Register in Cambridge. She was also a self-employed caretaker of elderly people in the Freeport area. 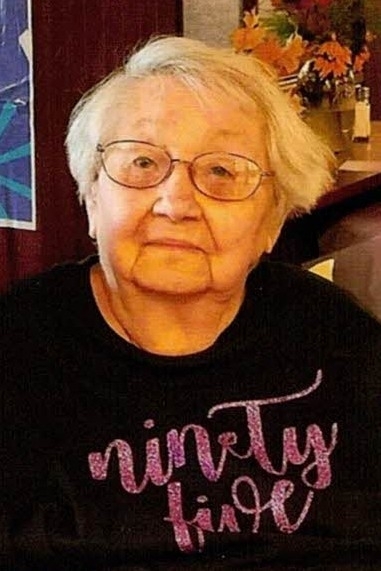 She belonged to the Ladies Auxiliary of the Stillwater Valley Post of the Veterans of Foreign Wars and was a lifetime member of the Lakeland Women Democrat Club. Her husband of 32 years, Robert Carl Pittis died April 30, 1988. They were married November 9, 1958. Surviving are a son, Robert Dean Pittis of Stuart, Virginia; a daughter, Michele Marie (David) Gross of Freeport; a half-sister, Dorothy Evans of Osawatomie, Kansas; two grandchildren: David (Linette) Gross of Freeport and Miranda Gross of Freeport; a step-grandson, Randy (Angie) Steele of Lawsonville, North Carolina; a great-granddaughter, Lisa Gross; twelve step-great-grandchildren; seven step-great-great grandchildren; Bob’s three daughters and their families: Patricia Frye of Canton, Cathy (Jim) McCalla of Alliance, and Karen (Don) Powell of Minerva. In addition to her parents and her husband she was preceded in death by two brothers: Lester Mounts who died in action during the war in 1945 and Bob Mounts, a half-brother, Ray Mounts; a daughter-in-law, Ilene Pittis, and a step-grandson, Kenneth Steele. Koch Funeral Home was honored to handle the arrangements for the Pittis family.